Boil a dozen small new potatoes until fork tender. Let cool. About 15 minutes before serving, heat a pan on medium. Add 3 tablespoons of sugar and let melt and start to brown. When the sugar is brown, add 1.5 tbsp of butter and 1/2 tsp of salt. Mix them together, keep the heat low. If it gets to high they start to separate. Drop the potatoes in the caramelized syrup and heat the potatoes thoroughly, about 7 – 10 minutes. Turn repeatedly so the potatoes are completely coated. Before serving, sprinkle a couple teaspoons of Jamaica Jerk seasoning over the top, stirring and rolling the potatoes around so they are completely coated. One of the things I brought home from the Food Bank is a package of great sandwich rolls. They were a bit old, so I lightly toasted them to freshen, just laying them unbuttered on a cast iron griddle to toast lightly. After the bread was toasted, I spread some mayo on both halves. On one side, I placed several slices of Earl Grey Roast Pork. On the other side, I spread some slices of Bosc pear and the impromptu cabbage slaw. This was delicious, there’s the savory pork, the sweet pear and the vibrant, tangy slaw all coming together. I will definitely make this again. I decided to post this recipe again because my original posting shared the recipe with a side dish and did not make the roast pork the centerpiece of the post. It deserves to be, as I make it so often. The recipe is beyond simple. Preheat the oven to 450°. While it is heating, open up 4 or 5 bags of Earl Grey Tea and dump them in the roasting pan. Add some salt and pepper and mix with your fingers. Now roll the roast around in the mixture, making sure to coat it everywhere. If it’s a lean roast like a loin, you can just leave it right there on the bottom of the pan. If it’s a fatty roast like this shoulder roast, put it in a rack so the drippings fall to the bottom of the pan. Stick it in the oven to roast. It will take about 30 to 40 minutes, depending on the size of your roast. Use a meat thermometer and remove as soon as it reaches 140°. This will give a you a beautiful pink, tender, and juicy roast. Let it rest a good 10 to 15 minutes before you cut. This lets it cook a bit more and ensures that all the juice does not run out. This is good with salads, sandwiches or just about anything you can think of. The tea’s flavor and aroma permeate the meat. It is hard to describe how good this is. After making the Roasted Grape Vinaigrette, I was hungry for a salad. I tore up some Romaine lettuce leaves to form the base, shaved off a couple slices from a fennel bulb and chopped them up, shaved three asparagus spars with a peeler, sliced three strawberries (they were twice the length of regular strawberry) and layered it all on the lettuce. I added the Roasted Grape Vinaigrette, assed some salt and pepper and sprinkled with feta cheese (a bit more than usual because the package was so close to empty) and that was it. The flavors are a good blend. The sweet strawberries are a delicious counter to the tangy feta, the fennel and asparagus complement each other and Romaine is always a good foundation. The vinaigrette is a perfect, sweet and tangy dressing. The Oregon Food Bank is an essential part of my monthly food budget, but except during the summer Harvest Share, it is a better source of canned and dry goods like beans, oatmeal and pasta than fresh foods. Most of the vegetables are at or past their sell-by date and it shows. However, that does not mean they are unusable. I went to the Food Bank yesterday and came home with about two cups of green grapes. They were more brown than green and looked rough around the edges, but I figured I could come up with something. I picked out the few that were actually rotting, only a small handful, and washed the grapes. I tasted one and it was pretty bland, its grape flavor lost, so I decided to roast them, hoping the dry heat would intensify their flavor. I spread them out in a pie pan and put them in the oven at 450° for about 20 minutes. They were starting to brown, but had no charring at all. I tasted another one, it had a rich, deep flavor now. I thought about making a sauce for some roast pork or chicken, but then had the brainstorm to make a vinaigrette – sort of a honey mustard vinaigrette without the honey, letting the roasted grapes provide all the sweetness. I think it was a stroke of genius. 1/4 yellow onion, cut in a few pieces so it’s easy to chop. First, clean, dry and roast the grapes at 450° for about 20 minute or so. Set aside and let cool. In a magic bullet, blender or food processor (I only have the first) put the grapes, olive oil, vinegars and mustard, salt and pepper and puree completely. This whips everything together and the oil and vinegar do not separate later. Add the onion and garlic and pulse a few times so they are chopped up into tiny bits, but not completely liquified. You can tinker a bit, adding more vinegar, salt, pepper, etc to get this to your perfect sweet-tartness. This is delicious salad dressing. It’s very tart with a bit of the sweetness of a sweet and sour dressing, but not nearly as sweet as a honey mustard. There’s a layered flavor from the roasted grapes that make me think of wine and a bit of smokiness. I will have fun trying it out. Make dressing first. Zest a whole grapefruit, Add 3 TBSP balsamic vinegar, 1/4 tsp sugar, 1 TBSP olive oil, 1 TBSP white wine vinegar, salt and pepper. This makes enough for three salads. Chop six leaves of romaine lettuce and layer on the bottom of a platter. Thinly slice about 1/4 cup of fennel bulb. Dice up about 2 TBSPs of onion. Supreme half a grapefruit and layer six segments on the salad. Toss about eight olives on top. Shave a few pieces of asiago or parmesan cheese on top. I sprinkled with a bit of tajín on top to add a bit of heat and zest. This salad is delicious. The olives and asiago add a bit of fatty creaminess to balance the astringency of the grapefruit and vinaigrette. The onions and fennel add sweetness and bite, balancing each other and the lettuce makes a solid foundation to marry all these flavors together harmoniously. It was a nearly perfect salad, I just should have made a little bit more. This delicious breakfast was easy to make and so tasty. Preheat the oven to 450°. Clean the asparagus and slice the onion into thins strips. Sprinkle with olive oil and kosher salt. Roast in the oven until they begin to caramelize. Meanwhile cook the sausage links in a pan on medium high heat. Use a fork to smash up the sausage into small bits. You can use ground sausage, too, but I didn’t have any. In a small egg pan, cook two eggs, over easy (or however you prefer) and season with salt and pepper. 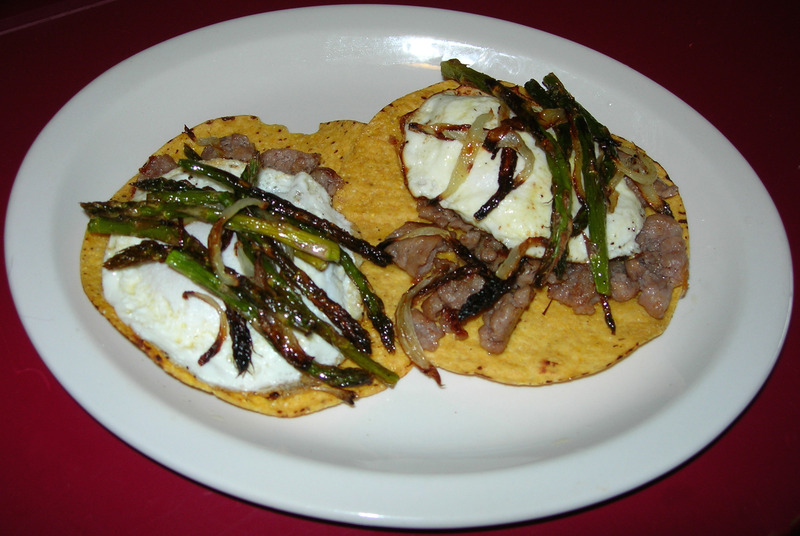 Put the tostadas on a plate, add the sausage, then the egg and the asparagus and onions on top. Before you eat, use a knife or fork to poke the yolk so it begins to seep out over the sausage, etc. Definitely poke the yolk before lifting up the tostada and taking a bit so it does not burst when you bite and send egg yolk all over your face. This is the voice of experience. This was delicious. The tostada gave it a great crunch and added a foundational flavor that the sausage and eggs combined with for this wonderfully satisfying umami flavor. The onions and asparagus brought some brightness and freshness, a great flavor combination. This makes one giant breakfast for this hungry person who skipped supper last night.